Provo • The BYU Cougars have entered the red zone — the space between an opponent’s 20-yard line and the end zone — 24 times in 10 games this season. They have scored only nine touchdowns in those forays into scoring territory. There are many reasons why BYU is 2-8 and suffering through its worst season in decades as it prepares to meet 4-5 UNLV on Friday (8:30 p.m. MST, ESPN2) at Sam Boyd Stadium in Las Vegas. The failure to finish rare lengthy drives with six points is definitely one of them. Only Kent State (2-7) of the Mid-American Conference, which averages just 10.7 points per game, lowest of the 129 teams in the Football Bowl Subdivision, is worse than BYU at getting TDs on its red-zone opportunities. The Golden Flashes are 4 for 17 at hitting pay dirt once they’ve reached the 20. 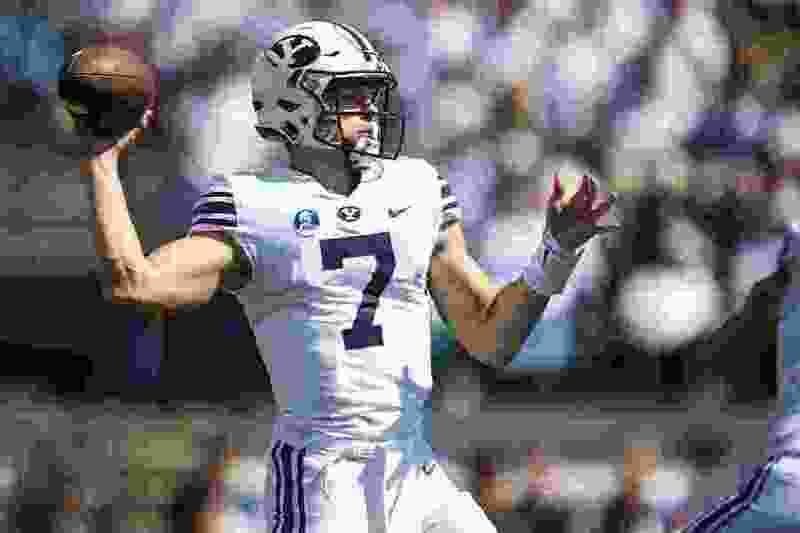 BYU offensive coordinator Ty Detmer pointed out Tuesday the Cougars entered the red zone twice in last week’s 20-13 loss at Fresno State and were 2 for 2. However, one of those scores was a 27-yard field goal by Rhett Almond after the Cougars had a first-and-goal at the 9. With this BYU offense, which lacks playmakers, there’s no margin for error, especially when yards are at a premium, safeties get down in the box and space is restricted. On the aforementioned drive, the Cougars were penalized 5 yards for breaking the huddle with 12 players and had to settle for the field goal that cut the deficit to 10-3 after a 4-yard pass to tight end Matt Bushman and two incompletions. BYU scored 33 touchdowns in the red zone en route to a 9-4 season last year when it had standout offensive weapons in Jamaal Williams and Taysom Hill. Those guys made winning plays. BYU is averaging 15.1 points per game, 125th in the FBS, this season. The Cougars are 123rd in total offense at 305.2 yards per game. “We have got to find a guy who we feel like is our playmaker,” Detmer said. “You watch other teams on Saturday throwing fade routes. We’ve got to be willing to do that or have a guy we feel really good doing that with. The Cougars were better the only other time they punctured the 20 against Fresno State, getting a 4-yard touchdown run from Squally Canada. Their second field goal, a career-high 46-yarder, came after they reached the FSU 24. But Beau Hoge, in his first of two stints filling in for Tanner Mangum that ill-fated night, threw two incomplete passes and was sacked. Later, Detmer dialed up a roll-out for Hoge on fourth-and-1 at the FSU 27, but the backup QB’s pass deflected off George Helmuth’s helmet and fell incomplete.